What do you snack on with a drink while you prepare dinner? Or set out for guests while you apply the final touches on a meal? Depending on the menu or the drink, we typically serve cheese and crackers or chips and salsa. If company is coming over, I put more thought into it, offering a variety of textures plus accommodations for dietary restrictions or sensitivities. I’m always looking for new ideas and inspirations for easy cocktail time nibbles. This week’s recipe for Cook the Book Fridays fits the bill. I’d describe Salted Olive Crisps as something between a thin savory biscotti and a full-loaded cracker. 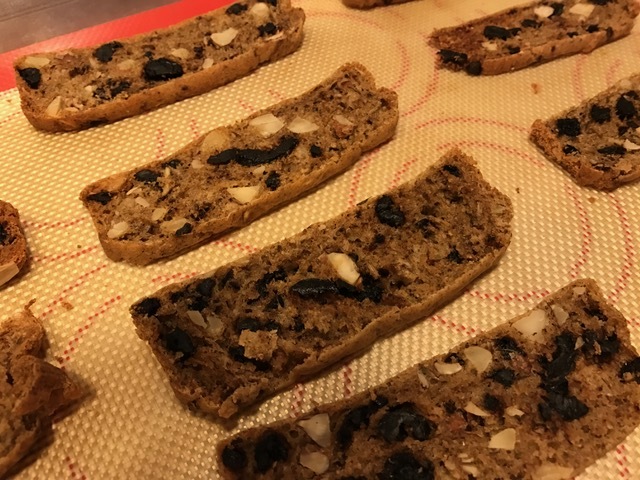 You start by making a shallow loaf of something like a quick bread with a healthy dose of Herbes de Provence and oodles of chopped olives and almonds. After the loaf is baked and slightly cooled, you slice the loaf as thinly as you can and bake the slices again to crisp them up. Once cooled, you have a treat to offer (to yourself or others) alongside a glass of wine or other beverage. Though I used a good bread knife, as recommended, to slice the loaf, my crisps weren’t quite as thin as they were meant to be. I think it’s because the recipe wasn’t clear about how long to cool to bake the loaf before slicing. I only let it cool until I could handle it, about 10 minutes. It was still warm. However, when the recipe said to turn down the oven temperature after the loaf came out of the oven, it seemed like I was meant to bake the slices shortly after the loaf was done. I felt like if the loaf had cooled completely, it would have been easier to slice thinner. The slightly thicker slices took longer to get to golden brown and still felt a bit soft. I baked these after dinner, so they weren’t cool enough to put in a closed container before bedtime. I put them back in the warm (turned off) oven to spend the night. In the morning, they were beautifully crisp. 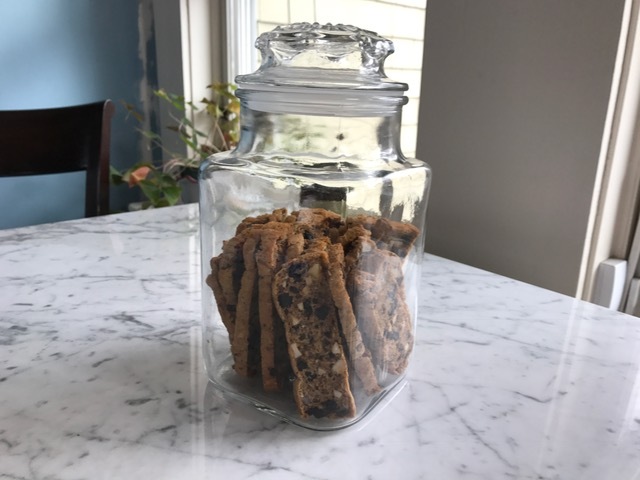 I used oil-cured olives that have a slightly sweet flavor and a chewy texture like moist raisins or prunes. In fact, I often use these same olives as a substitution for dried fruit in recipes that Howard would otherwise eat. 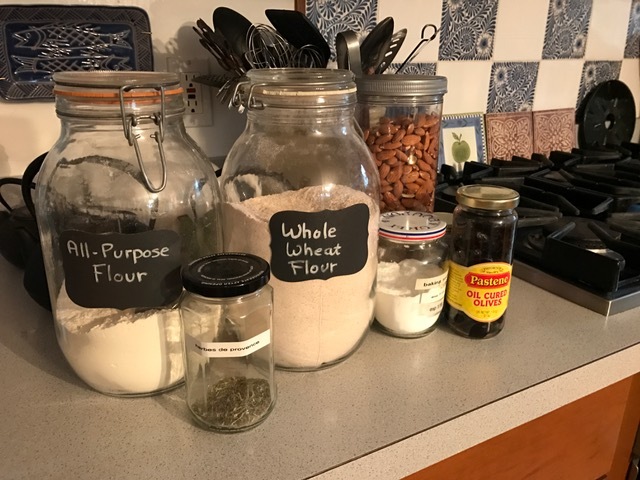 I can see this recipe serving as a springboard for many other combinations, varying the herbs, the olives, the nuts, and adding other savory ingredients such as sun-dried tomatoes or capers. I think it would be nice with a combination of sweet and savory ingredients, but I’d have to try that when I’m bringing treats to a friend (refer to constraint above). If you’d like to try these yourself, check out the recipe on page 42 of David Lebovitz’s My Paris Kitchen. You can learn more about other bloggers’ experiences with this recipe here. Or let me know when you want to stop by for cocktail hour chez moi, and I’ll whip up a batch and share! For the past few weeks, we’ve been getting 10 cucumbers each week as part of our CSA share. Sliced cucumbers sprinkled with spiced salt are a favorite, or of course, adding cucumbers to a salad, but I was looking for something new to do with cucumbers. For the past year, I’ve been doing some experimenting with cocktails. Usually, I just drink wine or beer. My repertoire of cocktails was mostly limited to frozen margaritas and daiquiris, both based on limeade concentrate. Now that cocktails are trendy, it felt like time to branch out. It all started last summer when we discovered Vena’s Fizz House in Portland which sells different mixers, like the base for the Small Batch Gin & Tonics we like. I also get inspiration from my favorite on-line mixologist and blogging friend, Christy Majors. When we were out in San Diego in June, we had a few cucumber cocktails. I didn’t pay close attention to what was in them, but, as we sat at the bar sipping our drinks, we did discuss how well they hit the spot on a hot afternoon. Necessity is the mother of invention, and the previously mentioned plethora of cucumbers reminded me to try this at home. Cucumber juice turns out to be very easy to make — no juicer required. Wash one or two cucumbers, preferably organically grown. Chop them coarsely. Don’t bother to peel or seed them. The skin gives the juice a wonderful chartreuse color. I quartered the cucumber lengthwise, then sliced it into half-inch slices. Throw the cucumber pieces into the blender with a handful of ice cubes for each cucumber. Turn the blender onto a high speed, and puree until smooth. Now strain the puree through a fine sieve. Press on the solids to extract as much juice as possible. You should get about 1 cup of juice for each cucumber. I’ve been playing around with the combination of cucumber juice, simple syrup, lime juice, and liquor. I’ve had success with both cucumber mojitos (rum) and cucumber gimlets (gin). The margaritas didn’t come out as well. 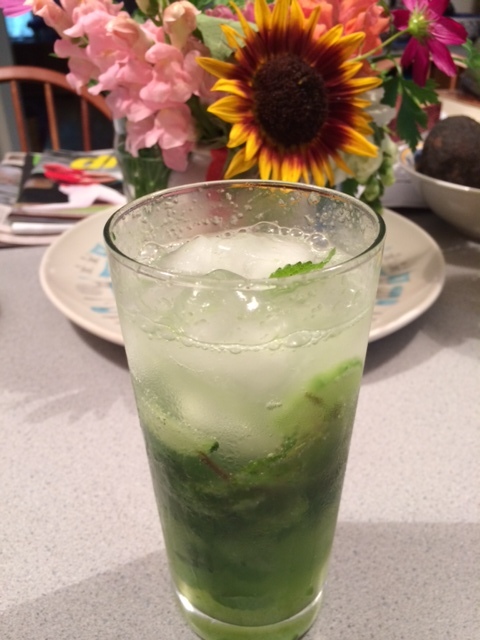 Mojitos start by muddling sprigs of mint in a tall glass before adding the other ingredients. For the gimlets, simply pour the ingredients over ice. Both are cool, refreshing, and delicious options for relaxing on a hot summer evening. In a tall glass, muddle the mint until it's very fragrant. Leave the mint in the glass, and fill it with ice. 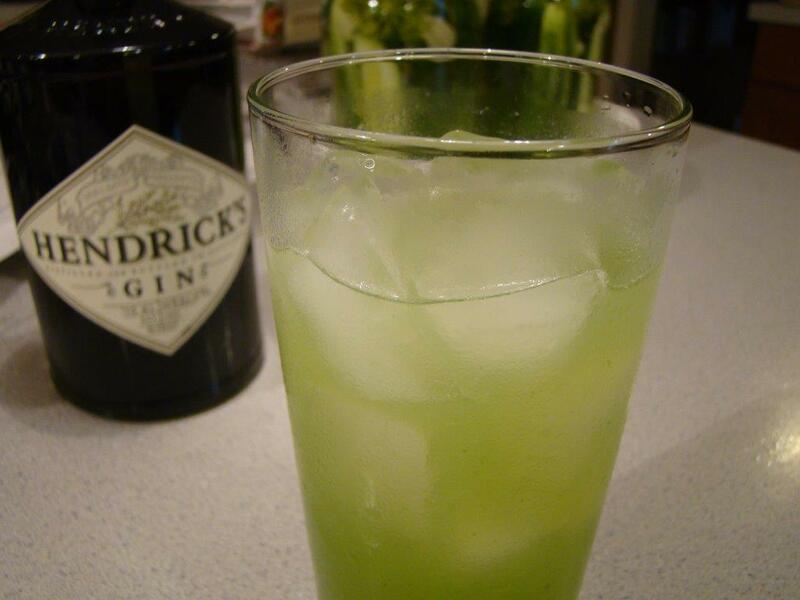 In a separate container, combine the cucumber juice, lime juice, simple syrup, and rum. Pour over the ice. Garnish with a cucumber slice and mint sprig.